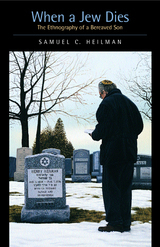 Samuel Heilman's eloquent account of the traditional customs that are put into practice when a Jewish person dies provides both an informative anthropological perspective on Jewish rites of mourning and a moving chronicle of the loss of his own father. This unique narrative crosses and recrosses the boundary between the academic and the religious, the personal and the general, reflecting Heilman's changing roles as social scientist, bereaved son, and observant Jew. Not only describing but explaining the cultural meaning behind Jewish practices and traditions, this extraordinary book shows what is particular and what is universal about Jewish experiences of death, bereavement, mourning, and their aftermath. Heilman describes the many phases of death: the moment between life and death, the transitional period when the dead have not yet been laid to rest, the preparation of the body (tahara), the Jewish funeral, the early seven-day period of mourning (shivah), the nearly twelve months during which the kaddish is recited, and the annual commemorations of bereavement. The richly informative ethnography that surrounds Heilman's personal account deepens our understanding of the customs and traditions that inform the Jewish cultural response to death. When a Jew Dies concludes by revealing the rhythm that lies beneath the Jewish experience with death. It finds that however much death has thrown life into disequilibrium, the Jewish response is to follow a precisely timed series of steps during which the dead are sent on their way and the living are reintegrated into the group and into life. Filled with absorbing detail and insightful interpretations that draw from social science as well as Jewish sources, this book offers new insight into one of the most profound and often difficult situations that almost everyone must face. Samuel C. Heilman holds the Harold M. Proshansky Chair in Jewish Studies and Sociology at the City University of New York. He is also on the faculty of Queens College, CUNY. He is the author of Defenders of the Faith (California, 1999), Synagogue Life (1998), Portrait of American Jews (1996), The People of the Book (1993), Cosmopolitans and Parochials (1989), A Walker in Jerusalem (1986), and The Gate Behind the Wall (1984).